Between Sun Set and Sun Rise The Family Caregiver’s Shift From Service to Self, covers the struggle of healing. Twenty-eight personal quotes and/or stories are told, a few in depth, all with commentary. Sixteen pages of glowing sunsets, inky dark clouds, fragile sunrises portray the movements of the caregiver’s progress toward renewal. Included is a document entitled “THE TO DO LIST AFTER THE PASSING”, a step by step advisory to keep business closures well sequenced. Between Sun Set and Sun Rise can be called a hand rail for those “graduate” family caregivers finding their way to their new self. A reader’s response upon finishing the book: “Peggy, if I could I would put one of these books in the hands of every family caregiver!” P. THOMAS, caregiver support group facilitator. Author: Testimonials on the back of the book speak without reservation, to the reality and usefulness of the unique treatment of that time block Between Sun Set and Sun Rise. A collection of Peggy Lutz’s memories between the years of 1944 and 1946, primarily recounting life of a young woman doing her part for the War effort as a US Navy WAVE, Women Accepted for Volunteer Emergency Service. WAVES were young ladies who were fully pledged, uniformed and attached to the US Navy only during WWII. They performed most of the same stateside assignments as their male counterparts. Because very little has been written about these women in uniform Lutz explains that her hope is that NEVER SALUTE WITH A BROKEN GARTER will shed some light on all the little threads that made up the fabric of military life for a woman between 1944 and 1946. 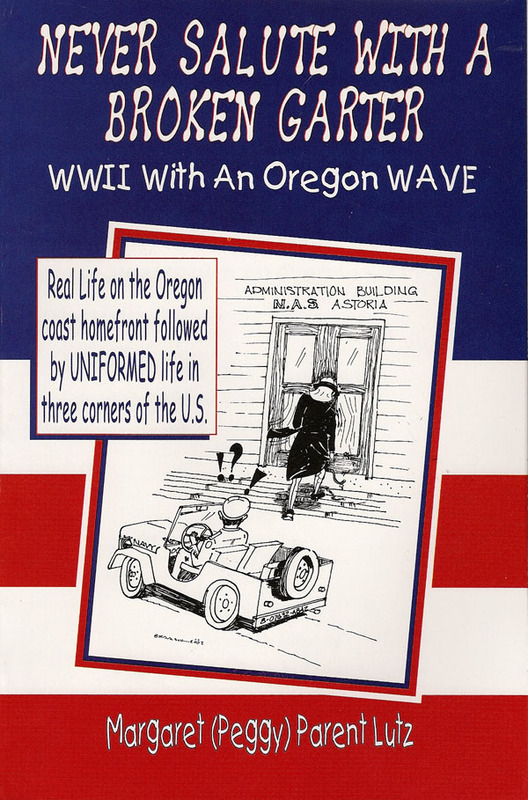 Never Salute With A Broken Garter offers a tell-all tale of firsthand WWII experiences, some of them depicting the Oregon coast civilian Homefront, but most of them about her time in the military service. Email Peggy at orewave@gmail.com to request your copy today! WAVES, WAACs WACs, SPARs, Army Nurses, a Cadet Nurse and a MARINE share their memories of boot camp or basic training as well as a few hilarious incidents during off-duty times. History comes alive as these ladies who were in their late 80s to early-90s as they wrote their stories, take a memory trip back to where they served during World War II. Follow one Army Nurse to Europe and the other to Alaska, then the Philippines. Laugh with the WAC who gave title to the book. Learn what travel was like for ladies on a troop train. But most of all, sense the attitude of purpose in all of these stories told by these WWII lady vets. And, admire the Army’s first female bugler who played Taps at hundreds of veterans’ funerals over the years, until she fell ill in 2008. She passed away in April 2010 after being admitted to the Bugler’s Hall of Fame, and receiving multiple local and national honors. The last writer passed away in 2017. Their stories would have been lost had they not been recorded in this book. In fact this book was so meaningful to some of the ladies that they left directions for Peggy to be notified upon their death. Between November 2003 and December 2005 I necessarily became a caregiver, joining the legions of older American women who have cared for their partners through the final years and months of their lives. 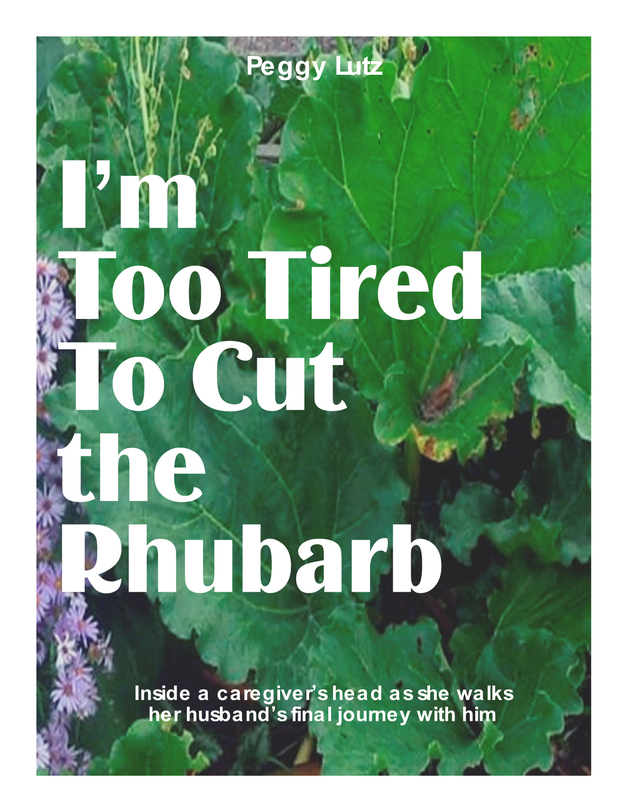 As the author of “I’m Too Tired To Cut the Rhubarb” I have recorded my husband’s last eight months of life, the ongoing internal monologue of my innermost thoughts, the way I confronted my new duty of thinking for, and deciding everything for someone else. Also, I have chronicled my own physical and emotional decline to an unprecedented depth. My story has taken the form of an 80-page self-published read intended to give credence and stature to the role of caregiver the job so in need of recognition, understanding and support. Our struggle to do all – and be all – wears us down. But our choice to serve our loved one until the end, gives us the deep satisfaction that comes from having fulfilled our commitment; wearing, taxing, exhausting as it was. Volunteers are a blessing, but the time comes when they are no longer up to the task, or the patient’s condition negates them. Then it becomes a frighteningly solitary task for the responsible spouse (more than 60 percent of the time the woman). The next fact is that little or no attention is given to the caregiver because both the medical world and the support system logically focus on the dying. This record emphasizes how little time the caregiver has to spend on one’s self, be it either a man or woman. And how that lack of attention hastens the decline and possible demise of the caregiver.